Why take a second look at your Supplier Code of Conduct? The foundation of any successful responsible sourcing strategy is an impactful Supplier Code of Conduct (SCOC). Beyond establishing requirements for an entire supply chain, it can also be a powerful risk mitigation tool. However, prioritizing the scope of issues and expectations can be a challenge for organizations across industries. Building off years of experience certifying responsible sourcing programs, Verego has developed a quick and effective SCOC Evaluation process. The evaluation is designed to be applicable for all organizations, whether beginning their sourcing journey or seeking improvements in supplier performance and compliance. 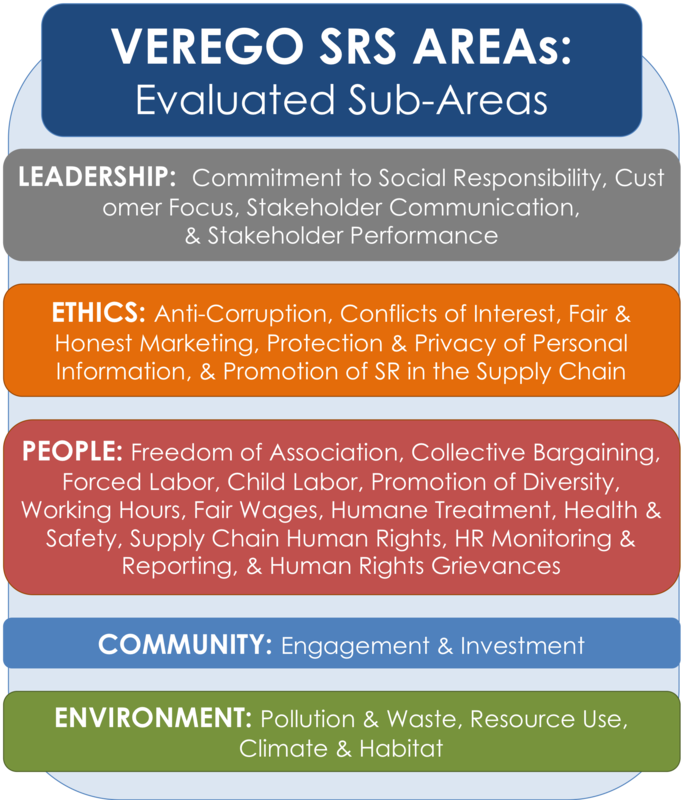 The topics assessed are key indicators of risk and emerging issues, aligning to Verego’s Social Responsibility Standard in the areas of Leadership, Ethics, People, Community, and Environment. To begin any Supplier Code of Conduct Assessment, an organization is required to complete a free online self-disclosure questionnaire to establish a baseline of responsible sourcing requirements. This questionnaire is offered for free and can be completed without any obligation to pursue a full SCOC Assessment. The preliminary evaluation should only take about 30 minutes and provides an organization with a benchmark score of their overall requirements. This initial score is used as the foundation to Verego’s final report in providing more in-depth feedback and target specific areas of improvement aligning to best practices and legal compliance. While we recommend taking the initial complementary assessment first, Verego offers a secondary comprehensive evaluation which applies a scoring methodology to an organization’s Supplier Code of Conduct requirements. Not only will this methodology produce a scorecard for each of the 5 AREAs of corporate responsibility (Leadership, Ethics, People, Community, and Environment) but will also provide best practice recommendations for any low-scoring sections. After submitting your Supplier Code of Conduct and payment, Verego will provide a written report, including scorecards and best practice recommendations, within two weeks (i.e. 10 business days). Looking to extend responsible sourcing requirements further into your supply chain? Verego’s assessment tools can also be used by your organization’s suppliers to ensure greater risk mitigation and transparency within your supply chain. Complete our free online assessment to establish a baseline of Supplier Code of Conduct requirements. Verego identifies material issues and potential risks based on Verego’s SRS Standard, which has been adapted to prioritize responsible sourcing topics. Your organization will be asked to provide your Supplier Code of Conduct or potentially additional materials or clarification around supply chain requirements. Verego’s scoring methodology is applied to evaluate the structured approaches and requirements based on legal compliance and best practice. The organization is provided a report of Verego’s conclusions, including scorecards to highlight strengths and areas of improvement for supplier expectations, which will be presented during a one-hour webinar. Learn more about how Verego can support your organization’s responsible sourcing strategy by clicking the buttons above to download an overview or request an evaluation!